Details of HP's upcoming Chromebook that was recently unveiled at IDF 2013 have landed. In addition to long-lasting battery life thanks to being the first Chromebook to feature Intel's fourth generation Haswell CPU, HP's Chromebook 14 features a 14-inch display with a HD resolution of 1366 x 768 pixels. That's a long way off Google's Chromebook Pixel (2560 x 1700 pixels), which packs more eye candy than a pair of sugar coated specs but costs a wallet-unfriendly £1,199. HP has set the price at a more sober £249, which places it in the same bracket as Samsung's Series 3 Chromebook and Acer's C7 Chromebook. Connectivity options include HDMI, USB 2.0 and USB 3.0 ports alongside an SD card reader, HD webcam and headphone and microphone jacks. It also houses a 16GB SSD drive that acts as local storage, keeps 'boot' times to a minimum and ensures it's nippy to use. Being a Chromebook, it runs Chrome OS and relies on internet connectivity to access Google's app ecosystem up in the cloud. HP says that US buyers will be able to pick up certain models from T-Mobile contract free with 200MB of 4G data per month for two years before mobile data rates kick in. We've contacted the company to see if a similar deal will be introduced in the UK. You'll also get 100GB of free cloud storage on Google's cloud storage service, Google Drive, which lasts for two years from the date the offer is redeemed. 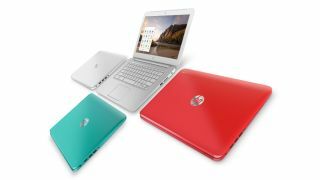 HP's Chromebook 14 will be available starting November from select UK retailers that will be stocking it in a range of questionably named colours, including Snow White, Ocean Turqoise and Coral Peach. What's that? Google's Chrome browser is set to get touchy feely?